Wonder is quite simply an awesome book. I enjoyed every page and devoured it within the space of a few hours. It is one of those books I can see I will continue to recommend for years to come. 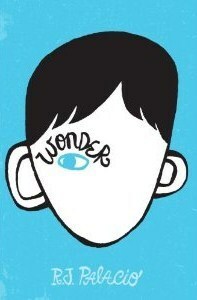 Wonder is about a young boy called Auggie who was born with a deformed face due to faults within his genetic makeup. As a small child he endured hours of painful surgical procedures but still he doesn't look 'normal'. Reading the book gave me real insight for ordinary people who are considered 'odd' by society and made my heart break for him as you saw all the discrimination he went through when he went to school for the first time. The thing I love about Auggie is that on the whole he is prepared to take his lot and just get on with his life without moaning or feeling sorry for himself. He just wants to be consider normal but his peers don't always let him. The most heart breaking thing for me was seeing how he reacted when other children treated him in a horrible way because he couldn't quite understand what gave them the right to treat him in such a way. I enjoyed how the story switched perspectives throughout giving you greater insight to the world in which Auggie lived. I especially found his sister's story touching in the way in which she had selflessly given up so much for her brother without complaining or jealously for the different ways in which she and her brother were treated. The overwhelming message you are left with by the end of this beautiful tale is one of hope and the notion that the world would be a much better place if people were more tolerant and kinder to each other. The way this is done really has a lot of resonance without being cheesy or preachy which is why I think it is such a stunning novel. Certainly a book I would recommend. There are many books out there that reminds us to be kinder with one another, and those are the ones I love the most. They make me feel warm inside. I'll be picking up this book sometime this year. I'm really nervous about reading this, but I think I'm going to have to! Fab review and totally agree. This book is brilliant. I loved Wonder too. I've got an interview with the author (and giveaway) going on over at my blog atm.